The Lost Bird Project memorializes 5 North American birds driven to extinction in modern times--the Carolina Parakeet, the Great Auk, the Heath Hen, the Labrador Duck and the Passenger Pigeon. Each memorial is being installed in the location where the extinct bird or flock of birds was last seen. Garefowl, Penguin, Pinwing, Gordo, Moyacks, Great Apponath, Geirfuglar, Wobble, Binocle—these are some of the names given the Great Auk by people who lived on the coast of Europe, north to Iceland, Greenland, to Newfoundland and down the eastern seaboard of North America. 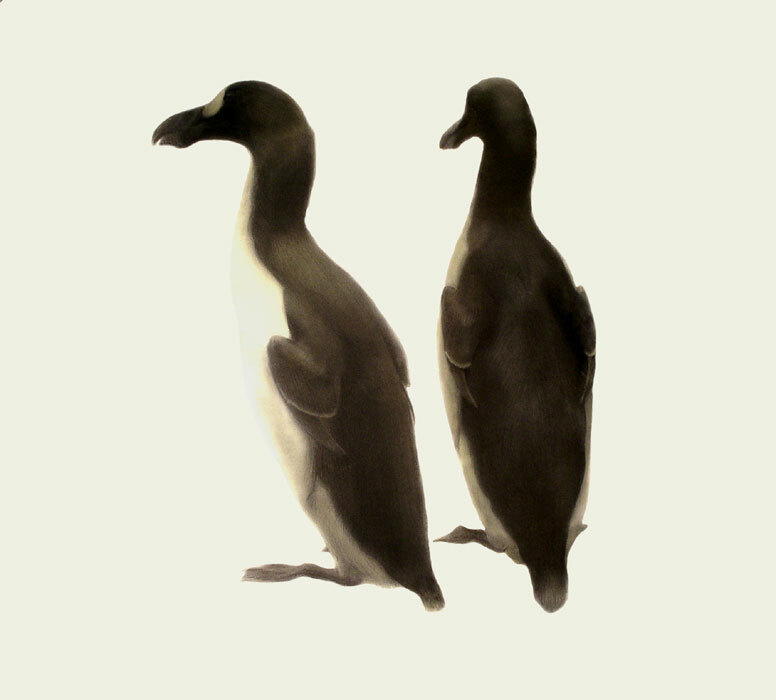 Swift and agile swimmers, able to dive to great depths, the Great Auk lived most of its life at sea. In the spring, auks came with their life-long partners to mate on the isolated rock islands of the North Atlantic. Flightless and awkward on land, the Great Auk was extremely vulnerable out of the sea. Although it had been hunted for thousands of years and was an important fresh meat source for early explorers, its numbers began to decline significantly in the 1500’s as it was overexploited for sale in the fish markets of Europe. In the 1770’s, its numbers were decimated as men corralled the birds by the thousands, and, using some of the birds bodies as fuel, boiled the auks to harvest their black feathers. The last documented pair of Great Auks was killed on Eldey Island on June 3, 1844. Eldey (Icelandic: Fire Island) is a small island about 10 miles (16 km) off the coast of the Reykjanes Peninsula, southwest Iceland. Located west-southwest of Reykjavík, the island of Eldey covers an area of about 3 hectares (7.4 acres), and rises to a height of 77 metres (253 ft). Its sheer cliffs are home to large numbers of birds.